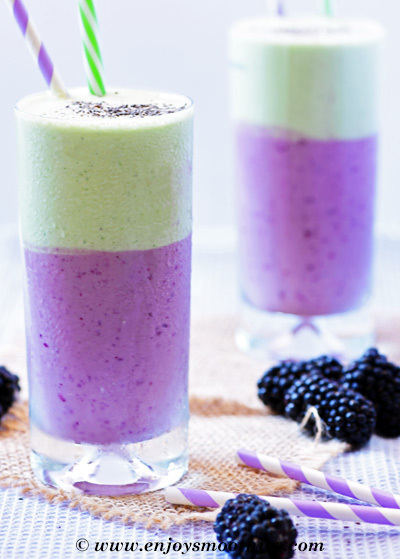 Blackberries might not be as popular as other berries such as strawberries or blueberries, but don’t overlook them when looking for smoothie inspiration. Similar to raspberries, but just a little bit tart, use blackberries the same way you would use other berries. 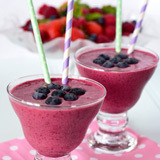 When making your blackberry smoothies sweeten them with other berries. You can also throw in other fruits such as bananas, oranges, pears, mangos and peaches. 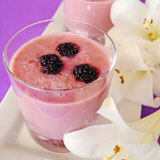 Why should you include blackberry smoothies in your repertoire? Because they are not just tasty, but are among the most powerful anti-wrinkle foods in nature. That alone should be reason enough. Their dark blue color signals their high antioxidant content, in fact one of the highest of all the fruits. They are also high in fiber, Vitamins C, A, E, K, and manganese. 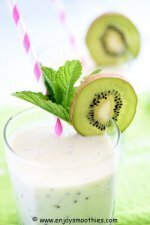 They are also low in calories, so make an ideal snack or smoothie. Blackberries are a seasonal fruit grown in summer and usually only available fresh from June through August. Out of season you will need to resort to the frozen variety. But these work just as well in smoothies. 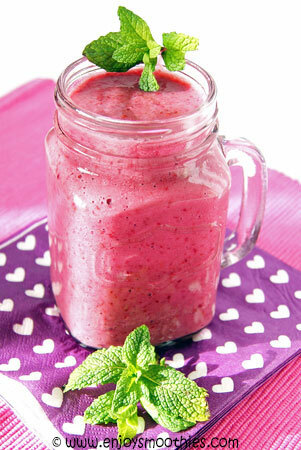 Using frozen fruit thickens your smoothie and means you can leave out the ice. When buying fresh blackberries look for fruit with a bright deep color that is not bruised or squashed. Blackberries are very delicate and bruise easily. Store them covered in your refrigerator for 3 – 6 days. Wash and pat dry just before using. First you need to make the blackberry layer. Add the frozen blackberries, yogurt, cashew butter, chia seeds and coconut water into a high-powered blender and blend until smooth. 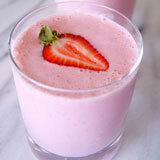 Pour into two glasses and place in the fridge to set for about 10 minutes while you make the next layer. Now to make the green layer. 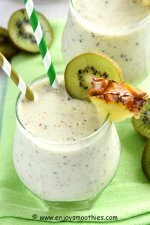 Rinse out your blender, then add the coconut yogurt, frozen banana, spinach leaves and coconut water and blend until smooth. If too watery, add some ice. Gently spoon the green layer over the top of the berry layer. Serve topped with extra berries. 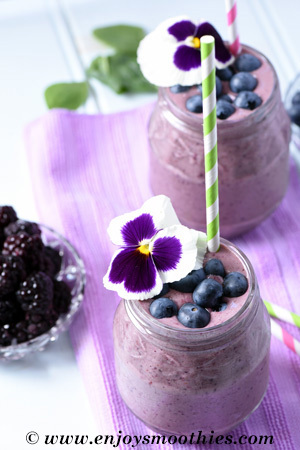 Blitz together the blackberries, blueberries, spinach leaves, vanilla yogurt, almond milk and ground cinnamon until velvety smooth. Pour into two glasses and top with fresh fruit. 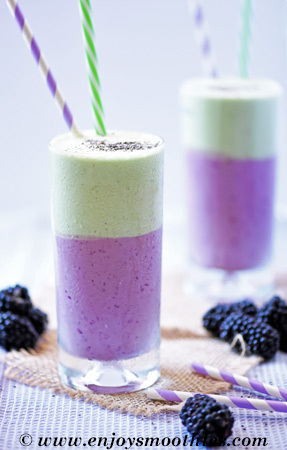 Place blackberries, banana, almond milk, apple juice and yogurt into a blender jug. 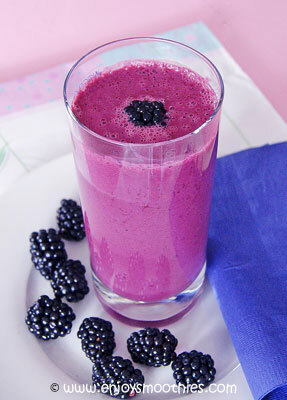 Blitz on high until blackberries are crushed and all ingredients are smooth and creamy. 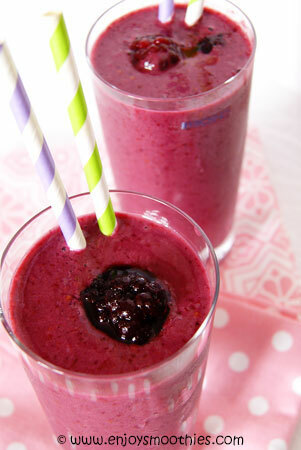 Place blackberries, raspberries, yogurt and almond milk into a blender. 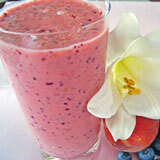 Blend until the frozen fruit is pulverised and your smoothie is creamy. 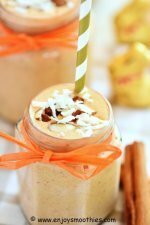 Taste your smoothie and if more sweetening is needed add the honey. Pour into a glass and serve immediately. Peel the orange and divide into segments. 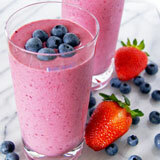 Add the orange pieces to your blender along with the blackberries, banana, orange juice and yogurt. Blend on high until smooth and creamy.